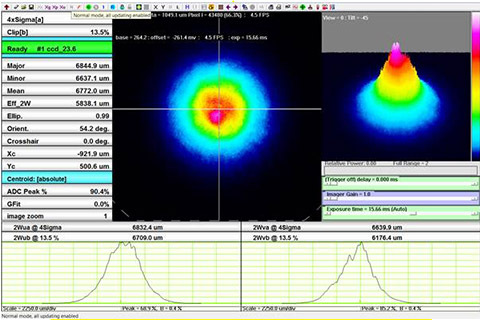 A frequent problem in integrating laser systems is insufficient to set the parameters of the laser source or process head. It is also quite common weak or no operators trainings. In order these facts there are unsatisfactory results of the manufacturing process. Thanks the extensive experience of our team we do not supply parts only, but we are able to adjust and tune-up technology even in current system or whille delivery of new one. Proper setup and system optimization leads to a significant increase in process efficiency, increase the speed of the production cycle and reduce energy intensity. In the area of ​​optimization we are primarily engaged in the very process of laser technology such – cutting, welding, cladding, hadrening, cleaning and marking while looking for optimal intersection of parameters to achieve efficient process. The main focus is the fine tuning process gases, penetration requirements, the visual quality of the cut and solutions to common technological and methodological errors. As part of the feasibility study we will in addition to samples and reports developed a plan according to the test criteria of production. Test results of analysis and design of appropriate technology and data to streamline production. As part of our support is also staff training in the principles of your system set the process parameters and the station, whether for safety or for control of optical and gas lines used in the system.